Cut your energy bills, stop relying on fossil fuels, and reduce your carbon footprint. 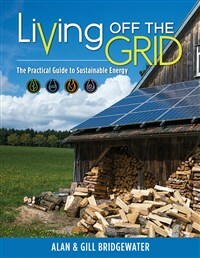 This book shows how to make sustainable energy work for your home, with practical off-grid options for solar, wind, wood fuel, geothermal, water, gas, and bioenergy. Gill and Alan Bridgewater have gained an international reputation as producers of highly successful gardening and DIY books on a range of subjects, including garden design, ponds and patios, stone and brickwork, decks and decking, and household woodworking. They have also contributed to several international magazines. Alan and Gill live in Rye, East Sussex. Alan and Gill Bridgewater have gained an international reputation as producers of highly successful gardening and DIY books on a range of subjects, including garden design, ponds and patios, stone and brickwork, decks and decking, and household woodworking. They have also contributed to several international magazines. Alan and Gill live in Rye, East Sussex.